This month our event will be held at a wonderful new venue, Baciami Italiano, located on Federal Highway in Boynton Beach. We invite you to discover true Italian hospitality in the heart of Boynton Beach at Baciami - Italian for "Kiss Me!" 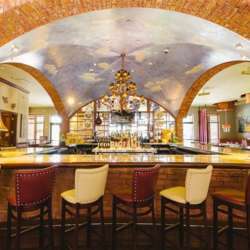 - for a wonderful evening with with authentic Italian dishes, wood burning pizzas, and a delicious array of Bar Bite appetizers for $7.77! We will also enjoy extended Happy Hour pricing on drinks and the Bar Bite appetizers exclusively for InterNations. Our event will be held in rear part of the inside bar area and the adjacent seating area - and outside seating area weather permitting! So join us for a fun and interesting evening spent with "old" friends and meeting new friends, connecting with like-minded folks. Formally our event starts at the slightly LATER than usual start time of 7:30 pm, however anytime after 7:15 pm is good. This is a little further north than usual, so maybe more West Palm Beach area residents could join us! Directions: From I-95 take Woolbright Road east, and continue straight for a few minutes to Federal Highway/US-1, and turn left/north, then take the first left turn lane, and turn under an archway "One Boynton", and immediately turn left, and continue for a short distance to the entrance on the right to plenty of covered free parking. After parking, walk across the small roadway into Baciami.